The records of the Commonwealth War Graves Commission provide a bit more detail, “Leggo, J, Private, 7929, 1st Battalion DCLI, died 23/08/1914, interred Cement House Cemetery XV111.B.13. Husband of Mrs K Leggo of Boswedden Rd, St Just.” John was not the husband of Mrs K Leggo, he was her son and unmarried. The grave registration documents indicate that he was initially buried as an unknown British soldier in Thulin Cemetery. In 1920 he was exhumed and reburied, still in Thulin but his identity was established at exhumation. The exhumation record also says that he was wearing his general service uniform but had no boots. In 1954 he was exhumed again and re-interred in Cement House Cemetery. John Leggo was killed on the first day of the battle of Mons (in effect the first day of actual fighting), one of about 1500 men killed, wounded or missing. He was the first St Just man to be killed in on the Western Front in WW1 and one of the first Cornishmen to die in World War One. John's military papers have been lost, destroyed by fire during World War II. However an account of his brief military service can be pieced together from the details that have survived. The DCLI 1st Battalion was regular army and in August 1914 was based at the Curragh (Dublin). It is not currently known whether John Leggo was a professional soldier and therefore already with the battalion or whether he was a reservist who would have had to travel from St Just to Ireland via the D.C.L.I. depot at Bodmin. The 1911 census describes him a surface labourer at a mine but whether he was still doing this in 1914 is not known. Britain declared war on Germany on 4 August 1915 (see On This day 4 August) and the battalion war diary records that mobilisation was ordered immediately. The diary goes on to say that by 7 August mobilisation was completed and for “some reason there was a large excess of personnel”. On 13 August the 1st D.C.L.I. boarded a train at the Curragh siding and travelled to Dublin from where they set off for France on the SS Lanfranc arriving Le Havre 15/8/1914. The diary describes in some detail the battalion's arrival in Le Havre and their first night in a “completely swamped” field before going on to describe their movements through northern France, mostly by train. By 6.30pm on 17 August they had arrived at Le Cateau from where they marched to Landrecies where they were billeted in a school until the 21st. On the 22nd they crossed the Belgian border and took up position around the village of Le Petit Crepin on the Mons-Conde Canal at about 4pm. 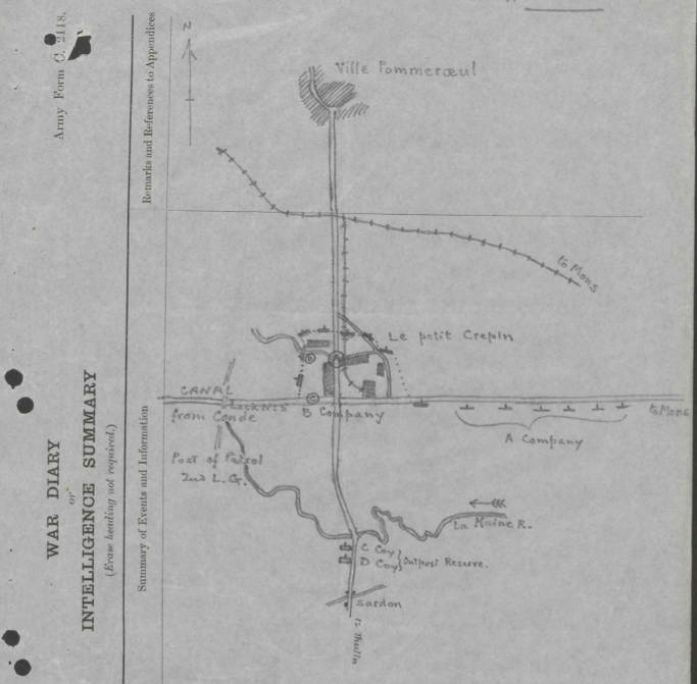 The disposition of the battalion is shown on the map which comes from the battalion war diary. The battalion dug itself in around Le Petit Crepin with forward outposts up the road towards the enemy, who had still not been seen. The Cornwalls were the left end of the line with the East Surreys to their right and the diary assesses the major weakness of their position as being their inability to bring fire to bear on the road north towards Ville Pommeroeul and the German lines. Not a glorious encounter, unplanned and unexpected on both sides and unusual in that a private soldier, Private Sambrook, was mentioned by name in the battalion diary. Private Sambrook survived until 14 September 1914, his name is inscribed on La Ferte-Sous-Jouarre Memorial to the men of the B.E.F. who fell at Mons, La Cateau, the Marne and the Aisne in August to October 1914 and have no known grave. Private Sambrook was 20 years old when he was killed. Lieutenant Saville and his men subsequently took a couple of prisoners, both in “a state of terror” and one who was so badly provisioned that he had been sharing oats with his horse. As the day progressed the Cornwalls further reinforced their position until at 4.45pm the enemy began to advance down the road towards them, a "solid mass and occupying the entire roadway.” The road had already been identified as the weak point but the Cornwalls were able to clear the advancing enemy off the road with concerted fire at 750 yards. The danger was now all too apparent however, the German numbers were vastly superior and the Cornwalls were ordered to fall back over the canal. It seems the 1st DCLI were able to retreat from the canal in good order back to Thulin whereupon they were ordered back into the firing line by Brigadier General de Lisle, 'who appeared to be in command'. This must have been early evening and they remained in the line until long after darkness after fallen. They found themselves under artillery and machine gun fire for some time and both sides made attempts to enfilade the other with little effect. This period is summarised as follows, 'Our men acquired a poor opinion of German musketry and a still poorer one of their artillery fire. As the results of several hours fire we had lost one man killed and five wounded. We withdrew without any difficulty at 11pm.' The dead man must have been John Leggo who must have died sometime between 4.45pm and 11pm, more likely in the later part of the evening. Private 7929 John Leggo was 24 years old when he was killed, the first of 79 men from St Just and Pendeen who did not come home. There were 7.2 million battlefield deaths during World War One. In total some 11 million soldiers and sailors died. Almost 1 million men from Britain and the Empire were killed; 527,000 of these men, well over half, have no known grave but are recorded on memorials to the missing, such as the Menin Gate and La Ferte-Sous-Jouarre Memorial.